Loaded with minerals,the very antiseptic Teatree foot scrub gently exfoliates, soothes,deodorizes and purifies your feet. The granular texture of the sea salt helps to remove dead skin particles, tones up the skin tissues, encourages peripheral blood circulation, and helps in skin renewal providing clean and smooth skin. Soak the feet in a warm foot bath for at least five minutes. Apply Tea Tree Foot Scrub to a loofah sponge or pumice stone and apply on foot in small circular motions to help reduce calluses. Place the foot back into the foot bath and rinse the ex-foliation product off. Be gentle when applying to the top of the foot. Dry the feet and wrap them in a heated towel for five minutes. Continue with applying a gentle lotion and massage for refreshed feeling. 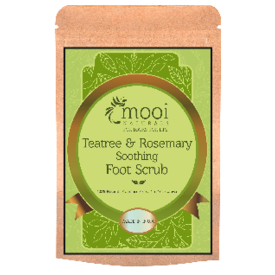 Loaded with minerals,the very antiseptic Teatree foot scrub gently exfoliates, soothes,deodorizes and purifies your feet. 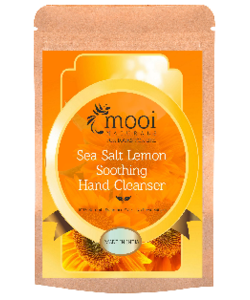 The granular texture of the sea salt helps to remove dead skin particles, tones up the skin tissues, encourages peripheral blood circulation, and helps in skin renewal providing clean and smooth skin. Directions Of Use: Soak the feet in a warm foot bath for at least five minutes. Apply Tea Tree Foot Scrub to a loofah sponge or pumice stone and apply on foot in small circular motions to help reduce calluses. Place the foot back into the foot bath and rinse the ex-foliation product off. Be gentle when applying to the top of the foot. Dry the feet and wrap them in a heated towel for five minutes. Continue with applying a gentle lotion and massage for refreshed feeling. All of Mooi Naturals products are vegan and cruelty free and do not contain either synthetic ingredients or ingredients of animal origin.